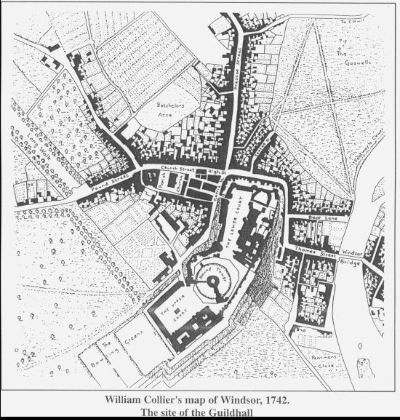 The furthest back we can trace the Windsor Fish family is 1740. This was achieved using the documented records in the Berkshire Records Office. The registers come from the following churches, St Andrew's Church in Clewer and St John's church in New Windsor. St Andrew's Church CLEWER is the oldest Building in Windsor, over 1000 yrs old. This church is in Clewer and parts of the church like the east corner is older than Windsor castle itself. The Church was established by King Edward in 985 AD. This church holds the original baptism records of our earliest traceable Fish family members. John Fish, his wife Elizabeth Fish and 3 of their 4 children, John Fish his wife Ann Scott, Richard Fish, James Fish and his wife Sarah Oslan were all buried in the grounds of this church. Their burials were from 1744 to 1824. 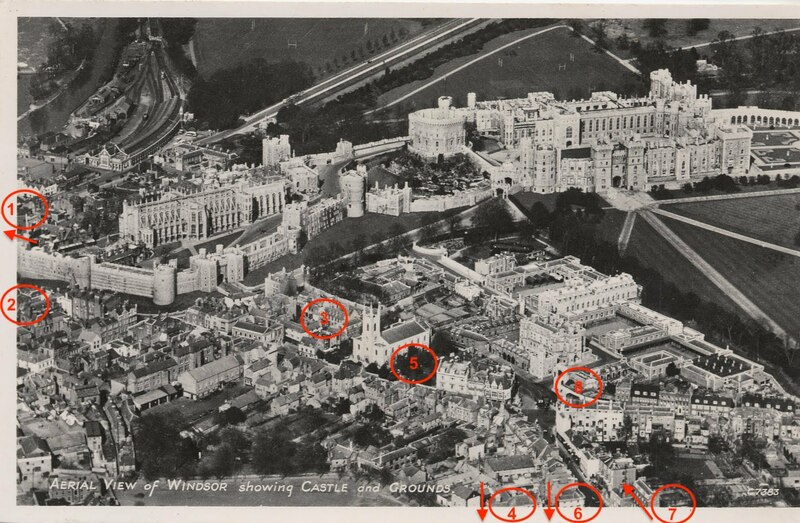 Aerial Photo of the Queens Castle in Windsor - St John’s Church is at the centre 100m from the palace in the high street. Hannah Fish #947, Sarah Fish , John Fish, Martha Fish and Stephan Fish were buried here in the church grounds. Their burials were from 1765 to 1788. Elisabeth Fish #949 grand daughter of John Fish #928 lived in George street 50 m from the castle (see photo above). St George’s Chapel (inside Windsor Castle Palace grounds) – was used by the congregation of St John while the church was being extended between 1660 and 1710. The parishioners took full advantage of this and for this period a record no of marriages took place here, some 900 in total, as much as 3 marriages a day. Many of the marriages were local artisans and tradesmen. Some prominent well known families from outside the county took advantage of this opportunity as well. Three Fish marriages (from outside the county) took place here during this period. They may have links to the Fish living in Windsor, no formal links established yet. (research for the future!) Please help if you can, thanks. 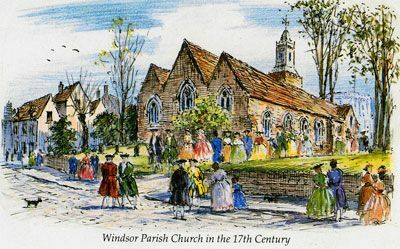 Peter Fish married 21-Aug-1664, in St Georges Chapel Windsor, to Sarae Jenings of Colebrooke Parish Langley countyBucks. Peter Fish of Iver County Bucks. Tho Fish of Parish Harborough "Licester" married 7-Nov-1695, in St Georges Chapel Windsor, toAnne Shipley of Parish Stamford in "Lincolne". James Fish of Marlow Bucks, married 10-Jun-1700, in St Georges Chapel Windsor, to Hannah Law of Marlow Bucks. 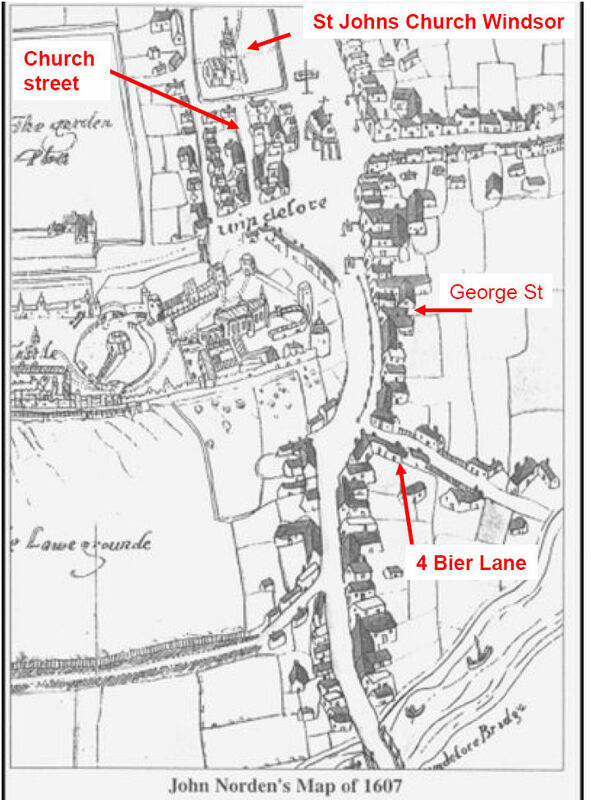 1 - William Fish lived in Bier lane New Windsor in 1841. 2 - Elizabeth Fish lived in George Street New Windsor 1841. 3 - William Fish also lived here in Church Street New Windsor 1871. 4 - Sarah Fish lived in Clarence Crescent New Windsor. church grounds of St John the Baptist Church shown in the picture above. 6 - Robert Slark & Sophia Slark (nee Fish) lived in Gloucester Place New Windsor 1841 Census. 7 - James & Sarah Fish lived in Sheet Street next to the New Inn Hotel they ran in Park Street between 1780 and 1800. 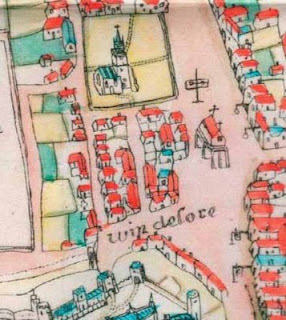 Fish Family is known to have lived at no 4 Bier Lane Windsor (ref. 1841 Census and 1881 Census) This etching / drawing was completed in 1725 about the time when the first Fish Families came to Windsor. 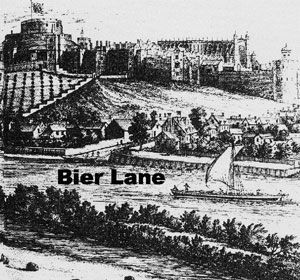 They lived in one of the houses shown on the left going up the hill in Bier Lane running perpendicular to the Thames river. The road is now called River Street. Some Fish were also boatmen as depicted in the picture transporting people from Windsor to London. 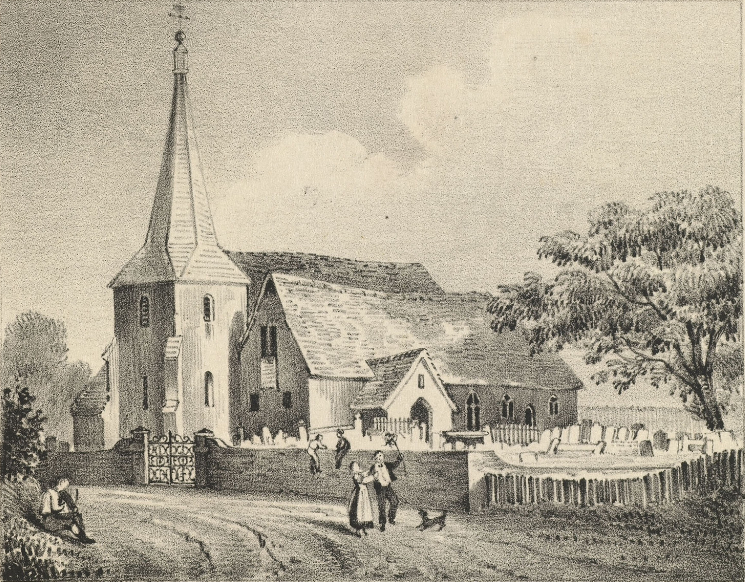 Between 1765 and 1788 Hannah Fish, Sarah Fish, John Fish, Martha Fish and Stephan Fish were buried here in the church grounds of St John the Baptist Church. "I give and devise unto my dear wife Sarah all those my freehold messuages or tenements with the stables and gardens ground and hereditaments there unto belonging situate and being in a certain street called Sheet Street in New Windsor in the County of Berks"
The location of James Fish's house is unknown in Sheet Street at this moment, it looks like he lived close to the New Inn Hotel he ran and also close to St Johns Church in New Windsor High Street. Sheet street runs down from the New Inn Hotel, Park street runs down and to the right of the New Inn Hotel, and Windsor High street runs up and to the left and past St John's Church. 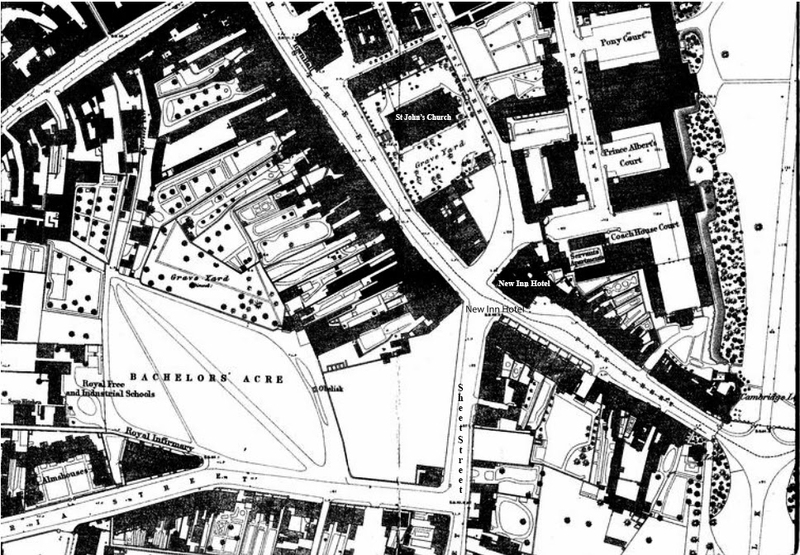 There are only 3 houses with gardens and stables in sheet street, see the houses on the right in the street map below, one of these houses were owned by the Fish family. Still lots of work to do to find out which one, The will says that the house should be should and a trust must be set up for the children under 21 yrs old.